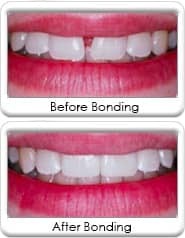 Dental bonding / composite veneering is a cost-effective procedure used to restore minor damage to teeth that have been chipped, broken or are decayed. It is also used to reshape a tooth and fill in gaps between the teeth. The dental bonding material is a tooth-colored resin that is applied to the tooth and then hardened with a special ultra-violet light. This "bonds" the material to the tooth in order to restore or improve the persons smile. Dental bonding is used for many reasons including the attachment of bridges, orthodontic appliances, and white fillings to restore teeth. Time to complete - Dental bonding takes about 30 to 60 minutes per tooth to complete. Dr. Clausen will match the tooth-colored resin material to the color of your tooth. Procedure - The tooth is cleaned and dried. The resin is then applied, molded, and smoothed to the desired shape. The bonding material is harden with an ultraviolet light. The hardened material is then smoothed, and polish to match the rest of the tooth surface. Dental bonding disadvantages include its tendency to stain over time and that it is not as durable as other cosmetic dental procedures. Its principal advantages are that is fast, can be matched to the color and sheen of the tooth, and if necessary, dental bonding can be easily repaired.